The schedule for the inaugural PIRTEK Perth SuperNight, the first under-lights Supercars races in Western Australia, has been released. Barbagallo Wanneroo Raceway will host a pair of Supercars night races on May 2-4, one apiece on the Friday and Saturday evenings. Tickets for the event went on sale last month. On-track action for Supercars begins with a 30-minute practice session from 6:40pm local time on the Thursday evening, May 2. That is followed on Friday by Practice 2 at 12:50pm and knockout ARMOR ALL Qualifying from 3:55pm. Fifty laps in duration, the opening 120km race of the weekend gets underway at 6:45pm local time, 8:45pm on the east coast of Australia. Saturday's schedule follows a similar pattern, with practice at 1:05pm and qualifying at 2:50pm. The weekend's longer race, 83 laps and 200km, also starts at 6:35pm that night. Sunset in Perth that weekend is, on average, 5:37pm each day. 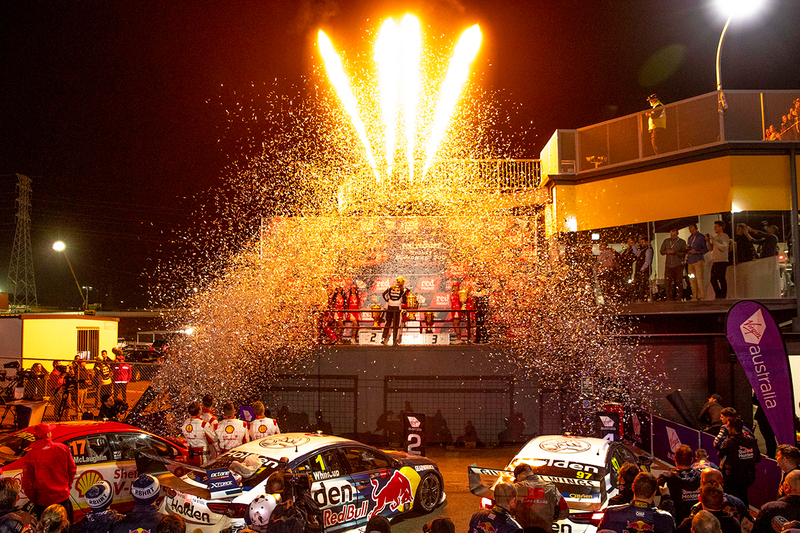 Sydney Motorsport Park hosted the maiden SuperNight event last year, the first Supercars night races in Australia since 1997. That was built around a single 300km race, but the Perth format more-closely follows the SuperSprint platform used at a host of other circuits. It includes knockout qualifying, with 10 free passes to Q2 on the line in Practice 2 and Practice 3 for Friday and Saturday respectively. Barbagallo has also been resurfaced over summer, which is likely to result in new Supercars lap records. The current race marker dates back to the last full resurface in 2004 and is a 55.9940-second effort from Jason Bright. Other categories in action include the Dunlop Super2 Series, ECB SuperUtes Series and Australian GT Championship. Super2 drivers will contest twilight races on Friday and Saturday, while a GT race follows Supercars each evening. The PIRTEK Perth SuperNight will be broadcast live on Fox Sports, with Network Ten also carrying the event.